The photos through out this blog entry are from the Wingscapes Bird Cam. I'm half tempted to to take it up to Sax Zim and place it around some of the deer carcasses. I'll have to see if I have some time before I leave for Connecticut. Looking at books coming down the pike this spring, I cannot wait to read Falcon Fever by Tim Gallagher. I love his writing style and falconry is one of my favorite subjects. I got a note from the Hiawatha Valley Audubon Society that my talk is open to the public, so if you would like to come, it will start at 7 p.m. at Holzinger Lodge in Winona, MN Wednesday, February 6. The talk will be about attracting birds and taking it a step further--cool things you can do once all the birds start flocking to your yard. 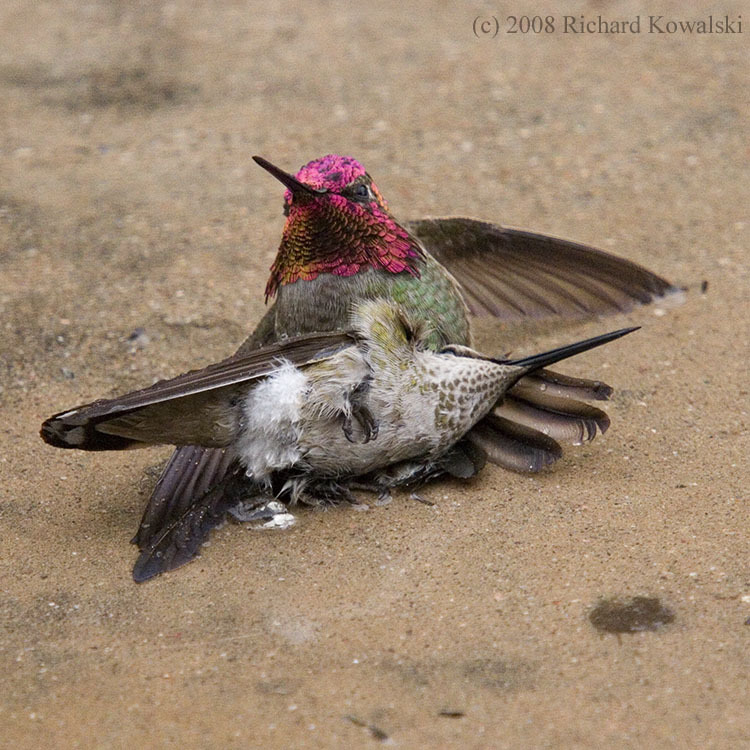 "I walked into my living room a short time ago and saw these two hummers on the patio under one of my feeders. I grabbed a few images. It did not look like they were mating (as can be seen in this image). I thought fighting, but the female seems to be laying on top of the male. Once I opened the door to step out to see if maybe they were tangled is something, they both flew off. If anyone has any ideas about what was going on with these two, I'd appreciate your input." usually heavier than females, so that could explain how he ended up under her. Several years ago at Paton's I saw two in-flight mating attempts by violet-crowneds. The pair (I think it was the same male both times, not sure about the female) managed to stay airborne a few inches off the lawn for at least 30 feet, and the male's tail seemed to be in the right position for copulation, but I think if the female had been a willing party she wouldn't have dragged him across the yard." Thanks for the insight Sheri! And on a final and non birding note, thanks to Let The Dog In, I have learned of a wickedly funny blog called The "Blog" of "Unnecessary" Quotation Marks. I giggled for a good twenty minutes over the "Ice Scoop" entry.